Horse Racing Like A Boss! ~ Smithankyou - Lifestyle and Travel Photo Blog. Horse Racing Like A Boss! 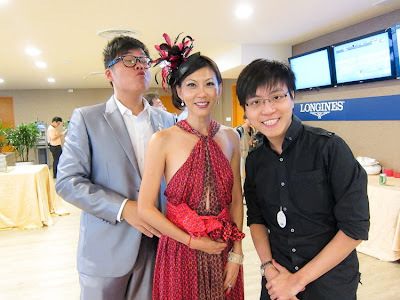 If you ain't very convinced about how I party with the girls after reading the previous post during the crocs event, guys I am going to show off again and this is how I attend horse racing events. Fine! I am a show off but comon dude. Would you not? From left to right we have Karen, Nira, Irene, Regina, Irene(another), Clara and Jessie! WADDUP ABOUT THAT MAN! I'm a little sad we do not have Eunice and Pearlin in the house! Anyway this picture is taken from Irene's facebook and it's taken during the Longines events at Singapore Turf Club. 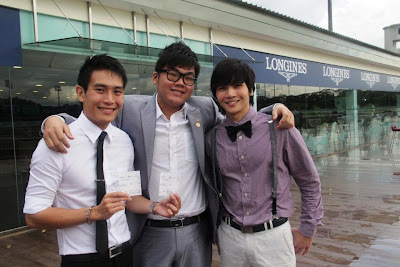 We were suppose to be able to meet Aaron Kwok but I guess the rain scare him away but we still had a great time eating, drinking and watching the races. And I bump into old friend James and new friend Leo! Both so handsome! Both Irene and Clara was part of the best dress. Oh! And James too! Although they didn't win they still had fun! I really love these events at the turf club as their event area looks really grand and clean and of course they treat you like a boss! I think it's quite a cool place to hold a wedding you know? And yes, I really love the girls that was there with me too! HAHA!